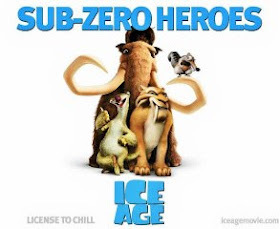 Ice Age plays at the Soo Theatre this weekend as follows: Friday, November 20 at 7:30 p.m.; Saturday, November 21 at 4 p.m. and 7:30 p.m.; and Sunday, November 22 at 2 p.m. Tickets are $5 for everyone. More details (a plot summary and movie trailer) from the Soo Theatre website. Editor’s Note: When we found out that Michael J. Wilson, the writer of the Ice Age story, is the son-in-law of Soo Theatre Board members Mary and Al McKay, we asked him for a little background on his experience. Here’s what he sent us. Ice Age began as a two-word idea that 20th Century Fox wanted to develop. Many writers went in and pitched on these two words. Pitched characters. Pitched story. Pitched anything and everything to get the job. This is what you call a "bake-off" in Hollywood. The good news is, you are "approved" to come in and pitch. Not just anybody can enter the bake-off. The bad news is, they don’t pay you for the work you bring in for the pitch. So, for all the time you spend preparing the pitch -- it’s a risk. You could end up with nothing! I spent two weeks researching the Ice Age. I discovered that for a brief period of time Neanderthal man and mammoths co-existed. The Neanderthals used the mammoth skin and bones and fur for everything. Shelter. Soup. Jewelry. Blankets. Weapons. You name it! Nothing was wasted. I came up with a central conflict. What if a mammoth saved a Neanderthal baby's life? What if this is the one mammoth a Neanderthal can't kill -- because he owes the mammoth big-time? My three-year-old daughter helped me with the pitch. She came up with a character in Ice Age that is a combination of a squirrel and a rat. She called him Scrat. "What does Scrat want?" I asked Flora. "Dad. Hello? Scrat wants the acorn." Wow! So simple. I have been forever in Flora's debt and creative shadow ever since. Speaking of my daughter Flora, at this period in time I was telling stories in her class every week. So, as I was writing the Ice Age script, I would pitch out ideas and characters and her class would help me write it. One day I was stumped. "What does Diego want?" I asked the class. (Diego is the saber-tooth tiger). One kid named Willie raised his hand. "Diego wants to EAT the baby!" he proclaimed loudly. Thus began the thread behind the story of Diego, and how he had a secret agenda, and was leading Manfred (the mammoth) and Sid (the sloth) and Roshan (the baby) into a TRAP! Thank you, Willie. The studio did not want Roshan's mother to die in Act 1. This was a big fight. They were afraid it was too scary and downbeat for little children. I pointed out many characters in many classic fairy tales and movies die. They insisted I let her live. But it did not work dramatically. I wanted Manfred to see her die so we would buy that he would take on little baby Roshan's plight. I won that fight -- but it took three months. Finally we compromised. I got to kill the mom. But it was a cutaway. One moment she was in the water pleading for Manfred to take care of her baby. When we cut back to her moments later -- she was gone. Drowned. It was very effective. I am so glad I won this fight! Studios are so afraid of scaring little kids. When I was four, I saw The Wizard of Oz. It was terrifying! I loved it! Can you imagine The Wizard of Oz without those flying monkeys? Or without the Wicked Witch trying to kill Dorothy? The best thing about creating the story for Ice Age and writing the script was that it took three years. It was so much fun! But eventually I got very burned out. Animation takes a long time. The rewriting is insane. They wanted me to move to New York where the animation was being done and keep working on it. But I had family obligations in California and couldn't go. Other writers were brought in. They created the dodo birds sequence which I love. They also added some other characters—some of which ultimately were cut from the finished film—and they did a lot of work and had a lot of fun with Scrat. They all did a great job. The theme for Ice Age is simple. Stick with the herd. At the beginning Manfred is a broken lost soul with no family. By the end he has integrated lovingly and successfully with Roshan and Diego and Sid. They are his "herd". I was very proud of Manfred's character. Especially the scene where he looks at drawings on the wall and remembers what happened to his family. The animation work on this scene is amazing. His face. His eyes. This is some of the best animation I have ever seen. Not a lot of noisy crazy graphics. Just pure simple emotion. I was asked to work on the other Ice Age movies but declined. You can't top that first one! I didn't want to try. The other movies are wonderful and very funny. But I love the emotion and the creation of the characters in the first one.